Indian names: kanel (Almora); bonta. kandregu, kanaregu, putikatada (Andhra Pradesh); binga, katai. tambat (Bengal); kanego (Dehradun); kankot (Gujrat); kangu (Himachal Pradesh); bhanber, bilangara, kandai, kangu (Hindi); bilangra, bilangur (Kumaon); boniso, potnaboniso (Orissa); kakoa, kandie, kangu (Punjab); swadukantaka (Sanskrit); bavache(Sind); malukkarai, sottaikala (Tamilnadu). Kangu is a commonly occurring wild tree in the forests of low hills up to 1,400 metres. This tree is generally found growing on the hill slopes in the forests. 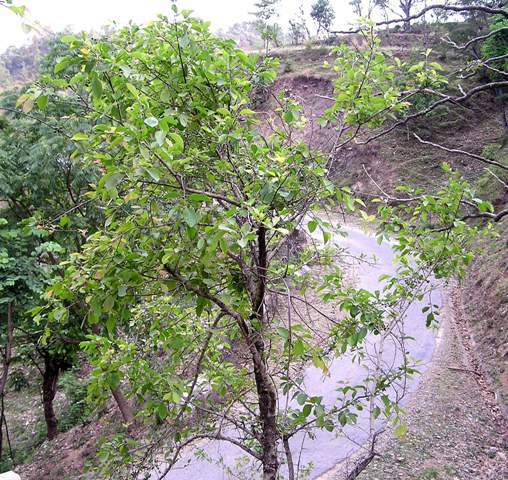 There are thousands of plants at one spot in the forest around the village of Batol, located at a. distance of 5 km away from Jabli (H.P.). 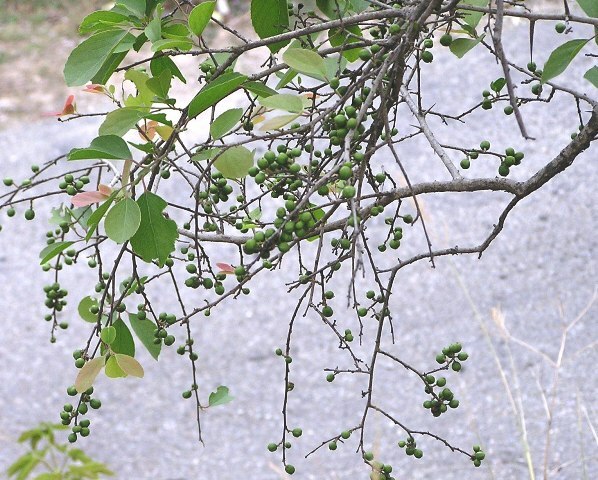 This tree bears fruits which are commonly eaten by the people in the villages. This tree is also found in peninsular India, the western Ghats, in the forests of Northern Circars and the Deccan up to 3,000 feet. A tall, thorny, woody, spreading; deciduous tree or shrub; dioecious; height, 4.5 to 7.5 metres; circumference of the main trunk, 60 to 84 cm; thorns, 4.5 to 5.2 cm long, branched in some cases; the stem bark, light to dark brown. Leaves, alternate, petiolate, having 1.5-cm-long petiole, oblong, crenate, 6.5 cm long, 4.9 cm broad; venation, reticulate; petiole as well as the lower surface of the leaf, downy; young shoots, light red and look very ornamental. Staminate flowers, ebracteate, pedicellate, asexual, cyclic, 4 mm in diameter; calyx, with 5 sepals, yellowish green, valvate, actinomorphic, pointed, 1 to 3 mm long; corolla., absent; androecium 3 to 4 mm long, with numerous (100 to 150) stamens, dorsifixed; inflorescence, nearly corymb, containing 7 to 10 flowers. Pistillate flowers, pedicellate, downy, diameter 8 mm; calyx, gamosepalous, with 5 sepals, green, united at the base only, forming a cup around the ovary, ebracteate, actinomorphic; corolla, absent; gynoecium with 5 pistils; style, short; stigma, bifurcated. Fruit, a berry, almost spherical, 6.2 to 12.5 mm in diameter, weight 685 mg, volume 515 microlitres; fully mature fruits, red. Seeds, 2 mm long, 3 mm broad, embedded in the pulp, weight 10 mg, volume 10.7 microlitres, generally 10 seeds per fruit. Full-grown kangu trees at Sanwara (H.P.) were observed to yield 7.5 k of fruits in 4-5 pickings. The pulpy fruit contains 62.1 per cent moisture in it. The total soluble solids content is 16.5 per cent. Acid content is negligible, whereas the total sugars are 13.92 per cent, mostly in the form of reducing sugars. The fruit contains 0.64 per cent pectin and 10.74 mg of vitamin C per 100 g of fruit and a negligible quantity of tannins. The content of total minerals of the fruit, as represented by ash, is 2.761 per cent. The protein content of the fruit is 0.79 per cent. In this fruit, the mineral elements, viz., phosphorus, potassium, calcium, magnesium and iron, are 0.055, 0.454, 0.068, 0.059 and 0.005 per cent respectively. The fruits of kangu are appetizing and digestive. They are given in jaundice and enlarged spleen. In the Deccan, the seeds are ground to powder with turmeric and rubbed all over the mother’s body to prevent rheumatic pains owing to exposure after the birth of a child. The bark is applied to the body, along with the bark of Albizzia, intervals of a day or so during intermittent fevers. The whole fruit is edible and is very sweet. The overall quality of the fruit is good. These fruits can also be dried. Kangu is a very tasty fruit and is liked by all. It has a very good keeping quality and can be transported to fairly long distance. This fruit can be used for making jams. The technique for jam-making should be standardized. This fruit can be very nicely dehydrated, and there is practically no loss of quality after dehydration. It was observed during the course of the present studies that the dehydrated fruits can be kept in polythene bags up to one year. The dehydrated fruits can also be ground to form a powder which is equally tasteful. The wood of this tree is hard and is used in making various agricultural implements. It is also used as fuel.